From attention and memory to logic and language skills, our games empower each player to play at their ideal level of challenge – just hard enough to grow, but easy enough to be fun. These “good for you” games can be played in as little as 10 minutes. 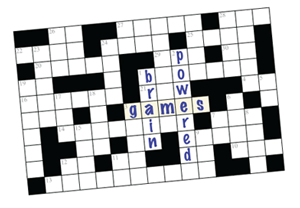 Brain Powered Games has been exhibited, presented about, and is the subject of scholarly research publications. Winn, B., Heeter, C., Winn, J., Fisher, J., Bao, L., Roman, C., Foster, D., Lazar, M., and Dong, R. Brain Powered Games. Exhibited at the International Academic Conference on Meaningful Play 2008 in East Lansing, MI, October 9, 2008. Heeter, C., Winn, B., Winn, J., Fisher, J., Bao. Headline Clues. Exhibited at the International Academic Conference on Meaningful Play 2008 in East Lansing, MI, October 9, 2008. Heeter, C., Winn, B., Winn, J., Bozoki, A. The Challenge of Challenge: Avoiding and Embracing Difficulty in a Memory Game. Proceedings of the International Academic Conference on Meaningful Play 2008, East Lansing, MI, October, 2008. Winn, B., Heeter, C., Maniar, A. An Analysis of Game Design Issues in Brain Games. Games for Health Conference, Boston, MA. June 11, 2009. Heeter, C., Maniar, A., and Winn, B. Making Sense of Brain Games: A scientific analysis of game design in the brain fitness market. Presented at the Game Developers Conference (GDC) 2009 Serious Games Summit, San Francisco, CA. March 24, 2009.